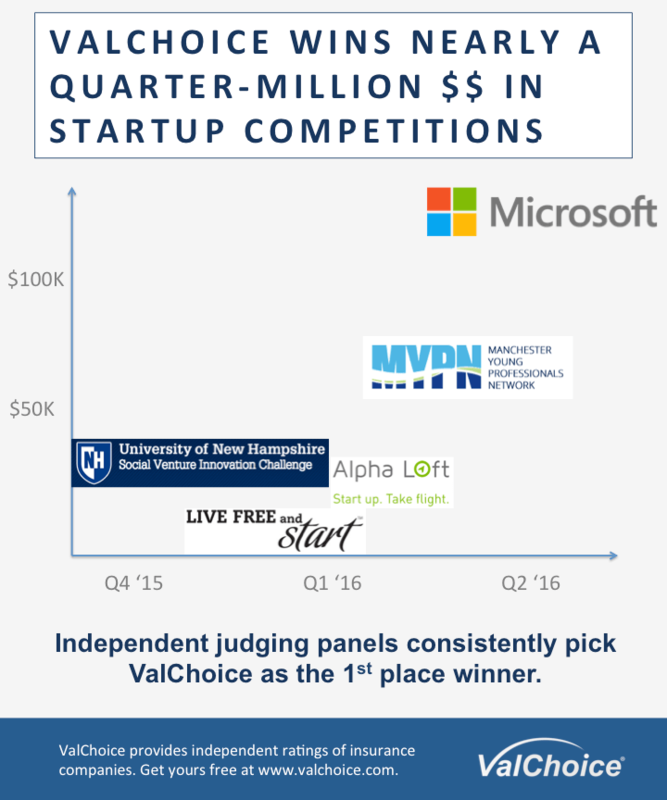 BEDFORD, NH – June 27, 2016 – ValChoice®, the first analytics company that lets consumers of insurance know which companies offer the best price, protection (claims payment) and service, today announced that it has received a $120,000 Microsoft BizSpark Plus Award as part of a global program to help start-ups succeed by giving free access to Microsoft Azure cloud services, software and support. 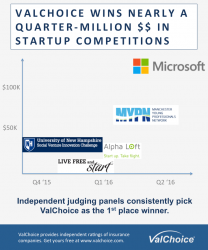 This Microsoft award comes on the heels of ValChoice also winning several start-up awards, bringing the company’s winnings to nearly one quarter of a million dollars in the last six months. Click here for an infographic showing these awards. ValChoice® is the only company to provide consumers, agents and advisors with information on which home and auto insurance companies offer the best value: price, protection and service. 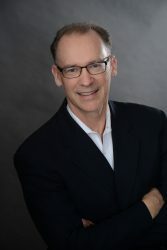 The company’s analytics platform collects and analyzes millions of financial and complaint data points and delivers the results in an easy-to-use service that Forbes Magazine describe as “Carfax for insurance.” Using ValChoice, consumers are finally able to shop for insurance based on value rather than making decisions blindly based on price or advertising campaigns. See this video link for a quick overview.